Bucchō, Butchō 仏頂 (Buccho, Butcho). Also Bucchōson 仏頂尊 (Butchoson). Literally “Buddha Crown.” A class of Esoteric deities who personify the bump of knowledge (Skt. = Usnisa) atop the Buddha’s head; they often appear as Bodhisattva, and can assume male or female form; in Japan, the Butchō are associated especially with rites for the dead, for their powers include purifying evil karma and liberating people from hell. See Glossary - Daibutchō Mandala for more details. Three Butchō (Sanbucchō, Sanbuccho, Sanbutcho, 三仏頂) known as Kōdai 広大 (Skt. = Mahodgatosnisa), Gokukōdai 広大 (Skt. = Abhyudgatosnisa), and Muhen'onjō 無辺音声 (Skt. = Anantasvaraghosa). Eight Butchō (Hachibucchō, Hachibutcho, 八仏頂). Three Butchō and Five Butchō; the eight sometimes appear in the Shaka-in 釈迦院 section of the Taizōkai (Taizokai) Mandala and in the Sonshō (Sonsho) Mandala. Nine Butchō (Kubucchō, Kobutcho, 九仏頂). Eight Butchō encircling Dai Butchou 大仏頂 or Shōissai Butchō 摂一切仏頂. 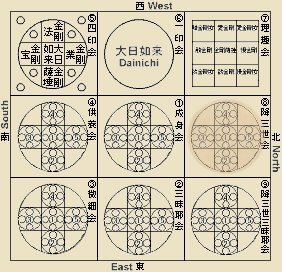 See Daibutchō (Daibuccho) Mandala. Ten Butchō (Jūbucchō, Jubutcho, 十仏頂). Nine Butchō and Futsū Butchō 普通仏頂. However, there are variations (e.g., there are different naming conventions for the Butchō, or different enumerations of the eight, nine, or ten). Other Bucchō. Ichijikinrin 一字金輪; Shijōkō Butchō 熾盛光仏頂; two others known as Butchō Sonshō 仏頂尊勝 (Skt. = Vijayosnisa) and Byakusangai 白傘蓋 (Skt. = Sitatapatra) became objects of popular individual cults (i.e., both are popular goddesses in Indo-Tibetan Tantrism). See Glossary - Daibutchō Mandala for more details. Buddhas of Three Ages and Ten Directions (Sanze Jippō Shobutsu 三世十方諸仏). Also Sanze Jippo Shobutsu. The three ages are past, present, and future. The ten directions are the four cardinal points, the four intermediate directions, and zenith and nadir. See Four Buddha and Five Buddha below for more details. Four Buddha of the Four Directions (Shihō Shibutsu 四方四仏; also Shihō Shibutsu). The first four Buddha said to have appeared during the current era of Buddhist time known as the Auspicious Aeon (Skt. = bhadra-kalpa; Jp. = kengō 賢劫). They correspond to the last four of the Seven Buddha of the Past (kako shichibutsu 過去七仏). The four are Kuruson 拘留孫, Kunagonmuni 拘那含牟尼, Kashō (Kasho) 迦葉, and Shaka 釈迦. However, the grouping varies considerably among sects and nations. See Four Buddha of the Four Regions below for more details. Four Directional Guardians. See two entries immediately above. Four Bodhisattva of Four Directions and Their Consorts. They appear in the Kongōkai Mandala (Rishu-e Panel 理趣会) surrounding Dainichi Nyorai and representing the four directions and four intermediate directions. These four are often shown together with female consorts, who represent the four intermediate directions. Four Guardian Bodhisattva (Shishō Bosatsu, Shisho Bosatsu, 四摂菩薩, or 四攝金剛) of the Diamond Realm. They hold the hook, the rope, the chain, and the bell, Vajrāṅkuśa 金剛鉤菩薩; Vajra-pāśa 金剛索菩薩, Vajra-sphoṭa 金剛鏁菩薩, and Kongōryō Bosatsu金剛鈴菩薩 (Skt. = Vajrāveśa, bell). See Aizen Mandala. Four Gods of Four Elements & Four Female Counterparts (Shidaijin 四大神). Also known as Four Diamond Protectors 四執金剛; also Four Great Deities (Shi no Ookami 四大神). NOTE: In the Kongōkai Mandala, one finds mention of Four Diamond Protectors. In Japan, these four are also known as the Four Great Gods (Shi no Ookami 四大神). According to Dr. Gabi Greve, each of the four has a female counterpart, a sort of heavenly princess (KI, 妃). The JIN reading signifies a deity of Japanese origin and Shinto associations, while the TEN reading refers to deities of Indian origin and Buddhist associations. The term TEN is translated in English as DEVA, and the above four deities are members of the 12 Deva Guardians of Buddhist tradition. In a purely Japanese context, the Shinto (JIN) names may also be read in a third different way. For example, Suijin may be read as Mizu no Kamisama, and Kajin may be read as Hi no Kamisama. Four Inner Offering Bodhisattva (Joy, Garland, Song and Dance). Four Outer Offering Bodhisattva (Incense, Flower, Lamp, and Perfume). See Ninningyo Mandala. Four Myō-ō 明王. Gōsanze (Gozanze) 降三世明王, Gundari 軍荼利明王, Daiitoku 大威徳明王 and Kongōyasha (Kongoyasha) 金剛夜叉明王. See Ninningyo Mandala. Four Paramita (Haramitsu) Bodhisattva (Shiharamitsu Bosatsu 四波羅蜜菩薩 or 四波). Female attendants to Dainichi in the Kongōkai Mandara; they are considered “mothers of the four quarters,” for each is the mother of one of the Four Buddha of the Four Quarters (Shibutsu 四佛). There composition varies according to source. Below list comes from Soothill (see Sources). Konkōmyōkyō 金光明經, a scripture to protect the state, gives E. Akṣobhya 阿閦; S. Ratnaketu 寶相; W. Amitāyus 無量壽; N. Madhura-svara-nirghoṣa 微妙聲. Dainichikyō 大日經, one of the main sūtra of Esoteric Buddhism, gives E. Ratnaketu 寶幢; S. 大勤勇遍覺華開敷; W. 仁勝 (i.e. Amitāyus 無量壽); N. Acala 不動, i.e. Divyadundubhi Meghanirghoṣa 鼓音如來. Five Buddha (Gobutsu 五仏). See Four Buddha above and Five Gochi Nyorai below. Five Buddha of the Diamond Realm (Kongōkai Gobutsu 金剛界五仏). See Four Buddha above and Five Gochi Nyorai below. Five Gochi Nyorai 五智如来; also Five Tathagata of Wisdom or Five Buddha of the Diamond Realm. The five Buddha 五仏 of the Kongōkai Mandala, with each symbolizing a particular wisdom. The all-encompassing wisdom of Dainichi Nyorai (the central deity) embodies the other four. In Japan, the Kongōkai Mandala is associated with wisdom (chi 智), while the Taizōkai Mandala is associated with ultimate principle (ri 理). Fukūjōju Nyorai (Fukujoju) 不空成就 (Skt. = Amoghasiddhi) | North | Wisdom Developed by Practice (Jōsho Sachi 成所作智; Skt. = Krtyanusthana jnana). NOTE: In the Tendai 天台 sect, Fukūjōju is replaced by Ususama Myō-ō 烏枢沙摩明王. Amida Nyorai 阿弥陀如来 (Skt. = Amitabha) | West | Wisdom of Subtle Observing. Wisdom of Wondrous Observation = Myōkan Zatchi 妙観察智 (Skt. = Pratyaveksana jnana). Five Great Myō-ō (Godai Myō-ō 五大明王). Godai Myoo, Godai Myo-o. These five preside over the five directions (center & four compass points). They are Fudō (Fudo) 不動明王, Gōsanze (Gozanze) 降三世明王, Gundari 軍荼利明王, Daiitoku 大威徳明王 and Kongōyasha 金剛夜叉明王. For a detailed review of the Myo-o Group, please see the Myo-o Page. Eight Offering Bodhisattva (Hachikuyō Bosatsu八供養菩薩); Also Hachikuyo Bodhisattva. They appear in the Kongōkai Mandara. Eight Great Bodhisattva (Chn. = Bādà Púsà, Jp. = Hachi Daibosatsu 八大菩薩 or Hachi Bosatsu 八菩薩). These eight are described in various Mahāyāna texts, wherein their names and attributes differ. The Sutra on the Maṇḍalas of the Eight Great Bodhisattva 八大菩薩曼荼羅經 (Hachi Daibosatsu Mandara Kyō), which was translated by Amoghavajra 不空金剛 in the 8th century and Faxian 法賢 in the 10th century, describes the attributes of each, including their mantra 密言 (secret words), their position in the mandala, the color of their bodies, and their mudra (hand signs). Below we present two different lists. In artwork, these deities appear in the Butsugen Mandala and in the Taizōkai (Womb World) Mandala. Eight Guardians of the Eight Directions (Happōten八方天). Guardians of the Eight Directions. See Celestial Deities below for full details. Condensed Visual Classroom Guide (click here to view). Below are quick links to the deities and hell concepts involved. Thirteen Butsu 十三仏 or 十三佛 (Jūsanbutsu, Jusanbutsu). Often mistakenly translated as “Thirteen Buddha,” for the group includes five Buddha 仏, seven Bodhisattva 菩薩, and one Myō-ō 明王. These 13 Buddhist deities are important to the Shingon school of Japanese Esoteric Buddhism. The 13 are invoked at 13 postmortem memorial services held for the dead and at 13 premortem services by the living for the living. They are associated with the 10 Kings of Hell and judgment in the afterlife. The grouping appeared around the 14th century and was popularized in the 15th. The grouping is considered a purely Japanese convention. Curiously, this grouping fails to appear in the 1690 Butsuzō-zu-i, a major illustrated Japanese dictionary of Buddhist iconography. These 13 deities may have served as the basis for another grouping of eight Buddhist divinities known as the Hachi Hogo Butsu 八守護仏 (Eight Buddhist Protectors of the Zodiac). There are various schemes for the memorial services. See 10 Kings of Hell for details. During the seven weeks following one’s death, tradition asserts that the soul wanders about in places where it used to live. On the 50th day, however, the wandering soul must go to the realm where it is sentenced (one of the six realms). The 49th day is thus the most important day, when the deceased receives his/her karmic judgment and, on the 50th day, enters the world of rebirth. A service is held to make the “passage” as favorable as possible. Prayers are thereafter offered at special intervals. SHINGON BUDDHIST INT'L INSTITUTE. 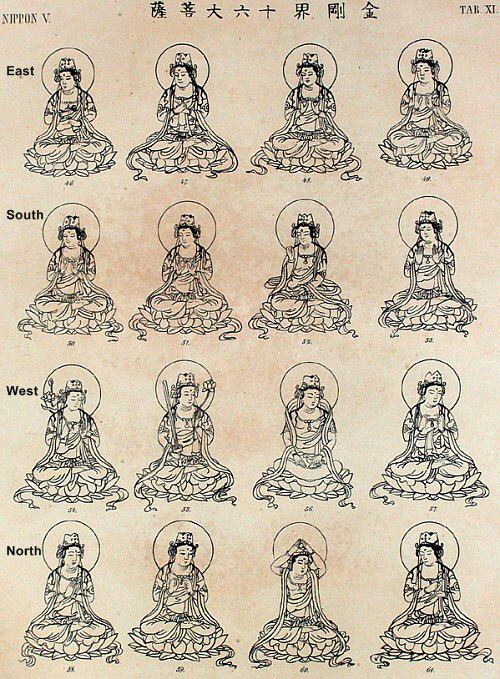 Thirteen Buddhas. Note from Site Author. The term "13 Buddhas" is misleading. This group of 13 includes deities outside the Buddha sphere. These sixteen Daibosatsu (those who cannot backslide) appear in the Gōzanze-e 降三世会 panel (see shaded circle, middle row, far right) of the Kue Mandala (lit. "Nine-Panel Mandala" 九会曼荼羅), which is the most widely used form of the Kongōkai Mandala 金剛界曼荼羅 in Japan. It is composed of nine panels, hence its name. The number of deities in each panel and their arrangement can vary, but the nine-panel format is standard. In most arrangements, the 16 Bodhisattvas are divided into four groups of four, with each group commanded by one of the Four Buddha of the Four Directions (Shihō Shibutsu 四方四仏). These Four Buddha (Jp. = Nyorai) are situated in the central position within their specific group. This results in four groupings, each with five deities. A fifth grouping of five deities is situated at the very center of the panel and is devoted to Birushana Buddha (aka Dainichi Nyorai), the foremost deity of Esoteric Buddhism. The Gōzanze-e 降三世会 panel is translated as “Mandala of the Vanquisher of Three Worlds.” The vanquisher is Gōzanze Myō-ō, who subjugated Daijizaiten 大自在天 (lord of the three realms of desire, form, and non-form) when the latter refused to submit to Dainichi. Gozanze literally means "one who subjugates the three worlds," although the three worlds are also said to refer to the three poisons of greed, anger, and ignorance. (NOTE: In Tibetan Wheel-of-Life Tanka / Thangkas, the three poisons are represented by three animals (a pig, a snake, and a rooster) drawn at the very center of the Tanka and often shown biting each others tails to show that these evils are inseparably connected.) The Gōzanze-e panel traditionally depicts Dainichi at the very center of the panel with hands in the Chiken-in Mudra 智拳印 (Wisdom Fist Mudra). The 16 Great Bodhisattva appear around Dainichi, many with their hands forming the Gōzanze-in 降三世印 (Mudra of Subjegation). 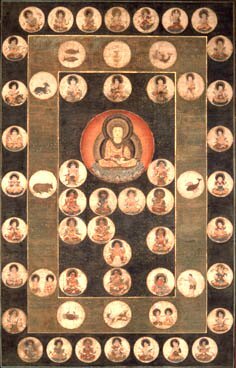 Starting in the east (see #2 in adjacent chart), and moving in a clockwise direction, the 16 Great Bodhisattvas are listed below (along with their primary attribute) as they appear in the Japanese Kue Mandala. Kakuban 覚鑁 (1095-1143), a Shingon monk also known as Mitsugon Sonja 密厳尊者, was a prolific writer. He composed a number of manuals concerning Shingon rituals, including the memory-increasing rite known as the Kokūzō Gumonjihō 虚空蔵求聞持法, the Ajikan 阿字観 rite of meditating upon the Sanskrit syllable “A,” and the Gachirinkan 月輪観 rite of meditating upon the Gachirin 月輪 (lit. moon disc). Click here for more details on Kakuban. Today, the Sixteen Great Bodhisattva are of particular importance to Zen practitioners, who recite the 16 Great Bodhisattva Precepts in various ceremonies at Soto Zen centers worldwide, in particular during the Bodhisattva Initiation Ceremony. For details, see Being Upright: Zen Meditation and the Bodhisattva Precepts (by Reb Anderson). The primary text for these 16 precepts comes from Banjin Dōtan 萬仞道坦 (also written 万仞道坦), an 18th century monk and scholar who compiled the Zenkaishō 禅戒鈔 (aka 改訂仏祖正伝禅戒鈔), which is translated as Essence of Zen Precepts. Philipp Franz von Siebold. 1832-54 Nippon. Archiv zur Beschreibung von Japan. Japanese resource called Butsuzō-zu-i 仏像図彙. See references below for details. Butsuzō zui 仏像図彙 (Illustrated Compendium of Buddhist Images). Published in 1690 (Genroku 元禄 3). A major Japanese dictionary of Buddhist iconography with hundreds of black-and-white drawings by Tosa Hidenobu 土佐秀信, with deities classified into approximately 80 (eighty) categories based on function and attributes. For an extant copy from 1690, visit the Tokyo Metropolitan Central Library. An expanded version, known as the Zōho Shoshū Butsuzō-zui 増補諸宗仏像図彙 (Enlarged Edition Encompassing Various Sects of the Illustrated Compendium of Buddhist Images), was published in 1783. View a digitized version (1796 reprint of the 1783 edition) at the Ehime University Library. Modern-day reprints of the expanded 1886 Meiji-era version, with commentary by Ito Takemi (b. 1927), are also available at this online store (J-site). In addition, see Buddhist Iconography in the Butsuzō-zui of Hidenobu (1783 enlarged version), translated into English by Anita Khanna, Jawaharlal Nehru University, New Delhi, 2010. Mandara Zuten 曼荼羅図典 (Japanese Edition). The Mandala Dictionary. 422 pages. First published in 1993. Publisher = Daihorinkaku 大法輪閣. Language = Japanese. ISBN-10: 480461102-9. Click here to purchase book from Amazon. North 無量意 (Mañjuśrī), 辨積, 金剛藏 Vajragarbha, 普賢 Samantabhadra. 16 Deities of the Auspicious Aeon (Gengō Jūrokuson, Gengo Jurokuson, 賢劫十六尊) of the Kongōkai Mandala. Also called the 16 Worthies of the Auspicious Aeon. Gakko 月光 included. Miroku included. Kokūzō included (corresponds to Gaga Naganja). Chidō Bosatsu 智幢菩薩 (transliterated as 枳孃襄計都; also known as 常恆菩薩, 常利益菩薩). There are also some mandala examples in which 1,000 Buddha of the "auspicious aeon" are included (need to give reference). 16 Good Gods (Jūroku Zenjin, Juroku Zenjin 十六善神). Protectors of the Daihannyakyū Sutra 大般若経 (Great Widsom Sutra, Skt. Mahaprajna paramita sutra) and those devoted to it. But more accurately referred to as the 16 Protectors of Shaka Nyorai (the Historical Buddha), or Shaka Jūroku Zenshin 釈迦十六善神, or Shaka Sanzon Jūroku Zenshin 釈迦三尊十六善神. They are depicted as warlike figures (Yasha 夜叉), and paintings of the sixteen were invoked at the Daihannya-e 大般若会 ceremony. They often appear in the Sangatsu-kyō Mandala devoted to Shaka Nyorai (the Historical Buddha). In addition, Hannya Bosatsu is sometimes surrounded by the 16 Protectors. The Kyoto National Museum provide photos and textual descriptions of various Raigo artwork. -- More on Amida Raigo from Kyoto National Museum (once there, visit the PAINTINGS section). 37 Deities of the Diamond World. Kongōkai Sanjūshichison 金剛界三十七尊. Centered around Dainichi Nyorai and composed of the Five Gochi Nyorai 五智如来, 16 Great Bodhisattvas (Jūroku Daibosatsu十六大菩薩), Four Paramita Bodhisattva (Shiharamitsu Bosatsu 四波羅蜜菩薩), Eight Offering Bodhisattva (Hachikuyō Bosatsu 八供養菩薩), and Four Guardian Bodhisattva (Shishō Bosatsu 四摂菩薩). See above for listings of these deity groupings. 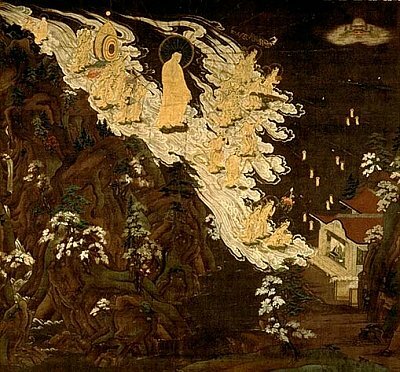 These 37 deities are classified into five families: (1) Nyorai-bu 如来部, Buddha Realm, Skt. = Tathagata-kula; (2) Kongōbu 金剛部, Adamantine Realm, Skt. = Vajra-kula; (3) Hōbu 宝部, Jewel Realm, Skt. = Ratna-kula; (4) Rengebu 蓮華部, Lotus Realm, Skt. = Padma-kula; and (5) Katsumabu 羯磨部, Action Realm, Skt. = Karma-kula. The Tathagata family is positioned in the center, with the other four placed in the four compass quarters. This format has gained great popularity in Japan’s Kongōkai Mandala. Big Dipper. Hokuto Mandara 北斗. See Hokuto Mandala. Happōten, Happoten, 八方天. Guardians of the Eight Directions (the four cardinal and four intermediary directions). Hokuto Mandala 北斗曼荼羅 (Big Dipper Mandala). Hoshi Mandala 星曼荼羅. A generic type of Mandala 曼荼羅 dedicated to the celestial entities, and including the Hokuto Mandala 北斗曼荼羅 (Big Dipper Mandala). Jitten 十天. Ten deva. Two more were added (heaven & earth) over time to the eight Happōten 八方天 (see above entry). Jūnikyū (or) Jūnigū 十二宮. The twelve houses of the Zodiac, also known as the zodiacal mansions; they are typically depicted in the Gekongōbuin 外金剛部院 section of the Matrix Mandara (aka Taizōkai Mandala or Womb World Mandala 胎蔵界曼荼羅). Visit this J-site for photos of the 12 zodiac houses found in the Star Mandala of Japan’s Shingon sect. Jūniten, Juniten, 十二天. Twelve Deities, or 12 Deva. A group of Hindu gods incorporated into Japan's Esoteric traditions; they came to supplant the Four Heavenly Kings (Shitennō 四天王) as protectors of Buddhism. This group of 12 was already invoked in esoteric rites by the Heain period. There are many extant examples of Jūniten masks (Jūniten Men 十二天面), which we used in esoteric ceremonies. The Jūniten appear together with their attendants in the Gekongōbu-in section 外金剛部院 of the Taizoukai Mandala. There is also a Jūniten Mandara 十二天曼荼羅 devoted to the four-armed form of Fudō Myō-ō. Another version of this mandala serves as the Anchin Mandala in the Shingon 真言 sect. Two more were added (sun and moon) to the Ten Deva (Jitten 十天) over time to create this group of 12 Deva. Kuyō 九曜 or Kushitsu 九執. The nine planets, which are the Sun, Moon, Mars, Mercury, Jupiter, Venus, Saturn, Rago 羅ご (Skt = Rahu), and Keito 計都 (Skt = Ketu). Details Here. Moon and Sun. Gatten 月天 (Moon, Skt. Candra) and Nitten 日天 (Sun, Skt. Surya/Aditya). Identified with Gakkō Bosatsu 月光菩薩 and Nikkō Bosatsu 日光菩薩. Myōken (Myoken) 妙見. Deification of the Polestar and/or Big Dipper. Nijitten 二十天. Twenty (20) Heavenly Gods appearing in Japanese mandala. Nijūhasshuku, Nijuhasshuku 二十八宿. See 28 Lunar Mansions. The twenty-eight lunar mansions (Skt. = naksatras), also sometimes called the 28 moon lodges or 28 stations of the moon. The 28 points in the moon’s monthly orbit were deified. In Japan, they are commonly depicted in the Gekongōbuin 外金剛部院 section of the Matrix Mandara (aka Taizōkai Mandala, Womb World Mandala 胎蔵界曼荼羅) of the Shingon and Tendai sects. They appear in the form of celestial maidens (seven in each quarter) and also in the Hokuto Mandara 北斗曼荼羅. Polestar. See also Myōken Mandala. Seishuku (or) Shoshuku 星宿. The Japanese term for “constellation.” It refers to the celestial bodies, stars, constellations, planets, moons, and other heavenly objects that were incorporated into Buddhism and deified. Seishukubu 星宿部 (sidereal division). A term used sometimes to refer collectively to the celestial bodies that have been deified in the esoteric Buddhist pantheon. Shichiyō 七曜. The seven days of the weeks, all deified. Visit this J-site for photos of the seven found in the Star Mandala of Japan’s Shingon sect. Shukuyō 宿曜. Another term for "constellation.” See entry for Seishuku above. Sun and Moon. Nitten 日天 (Sun, Sk: Surya/Aditya) and Gatten 月天 (Moon, Sk:Candra). Identified with Nikkō Bosatsu 日光菩薩 and Gakkō Bosatsu 月光菩薩. Yōshuku 曜宿. Celestial bodies, celestial orbs, including the sun, moon, planets, and the 28 constellations. Shukuyō-kyō 宿曜経. Also read as Sukuyōkyō. T 1299.21.392c6. Dictionary of Chinese Buddhist Terms. With Sanskrit & English Equivalents. Plus Sanskrit-Pali Index. By William Edward Soothill & Lewis Hodous. Hardcover, 530 pages. Published by Munshirm Manoharlal. Reprinted March 31, 2005. ISBN 8121511453. Gabi Greve deserves special thanks. She is my 2nd pair of eyes, a site contributor, and often reviews my pages for errors/omissions. Copyright 1995 - 2018. Mark Schumacher. Email Mark.